CrossFit HCC does not look like your typical gym. You will notice several things are different, there are no rows of treadmills, ellipticals, and cable machines or mirrors. Instead, you will find pull-up bars, kettlebells, barbells and an open gym space for squatting, running, jumping, climbing, lifting and throwing – performing movements that our bodies are designed to do. Our workouts consist of exercises that mimic movements performed in day-to-day life or sport. We rarely bicep curl anything in life so why would we do it in the gym? We focus on functional movements that are essential to lead a successful, independent lifestyle. At CrossFit HCC, we constantly vary our programming. This means you will rarely do the same workout twice in a 6-12 month time period. You do not have to program workouts for yourself, all you have to do is show up ready to work. And you will not have to spend hours at our gym to get a great workout. Instead, each day a workout will be provided for you that is scalable to your fitness level. And because our workouts are rarely longer than 60 minutes, you can get in your workout and get on with your life! The goal of CrossFit is to improve your capacity in ten recognized general fitness skills: cardio-respiratory endurance, stamina, strength, flexibility, power, speed, coordination, agility, balance, and accuracy. This should be the goal of a BALANCED fitness program. This is what makes CrossFit the most well rounded fitness program available! CrossFit has a group training format with classes lasting 60 minutes. At CrossFit HCC, our classes are smaller to maintain that Coach to Athlete ratio, giving you more one-on-one attention.There are several classes a day that members can attend. There are some in the morning, a mid-day, and some at night. You are strongly encouraged to come as often as possible, the more you come the quicker and greater the results. But not everyone’s schedule allows for that, so sign up for the classes that you can attend. 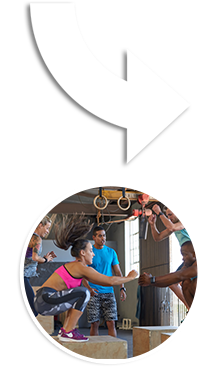 The classes are group workouts that start with a warm up, consisting of stretching, some light cardio and some body weight exercises. Then the Work Out of the Day (WOD), starting with a skill development section to focus on form, technique, and general CrossFit skills followed by a strength exercise usually involving weightlifting. Finally, the workout, which changes every day and focuses on different parts of your body. Your workout will be timed and conducted at a high intensity. Everyone does the same workout at the same time, but your only competition is with yourself. “You don’t need to be better than anyone else, just be better than you were yesterday”. There will always be a certified coach there to instruct, help, correct, and inform everyone. All you need to worry about is showing up to the class, no matter what your fitness level, and you will be told exactly what to do. No contracts, no commitments, just get in shape and have fun! Constantly varies, always changing workouts, never letting your body adapt. This is why CrossFit is great for getting results. Your body never gets used to anything so you never reach those plateaus that are so common in a traditional gym. CrossFit is one of the most popular fitness programs in the world, and for good reason. Providing a strong, community-based atmosphere to improve motivation and drive results. The CrossFit community is diverse; it includes members of our military and military veterans, full-time moms, doctors, lawyers, police officers, fire fighters, business men and women, elite athletes, students and grandparents. That is the beauty of functional movement- it is applicable across all walks of life. We at CrossFit HCC want to make your life better because that is what fitness should be! CrossFit is the principal strength and conditioning program for many police academies and tactical operations teams, military special operations units, champion martial artists, and hundreds of other elite and professional athletes worldwide. At CrossFit HCC, we will incorporate that same type of training and scale the program to your fitness level. You can train like the pros and see results like the pros…but you will have to be committed and work hard! CrossFit burns fat more than any cardio training you’ve done before, tones faster than any personal trainer routine and builds confidence that carries on to different aspects of your life. CrossFit is a demanding and tough way to exercise, what makes the program ideal for anyone looking to get in shape, lose weight, feel stronger and become more mobile, is because the workouts are scaled and modified for all fitness levels. Whether you 15 years old or 50 years old, whether you are a trained athlete or just someone working out for the first time, CrossFit can be for you! It can is an excellent way to build up strength, stamina and endurance. Strengthening our core muscles is so very important to improving our ability to engage in day to day functional activities, yet it is so often neglected in traditional gym workouts. For some people who are considering CrossFit, that could be a terrifying thought because you are afraid it may make look too bulky. With CrossFit this will not be the case as you will not be focusing on just lifting weights, but also on making sure that your body is sculpted and toned. CrossFit is great it is for building your perfect body. Though, it will not be easy, and in most cases it will require a great dose of self-discipline. CrossFit is meant for gaining a lean body and for fine-tuning your muscles. If you want to grow more lean muscle, CrossFit can do that as well, if that is your goal just let your coach know what your goals are and they will help you achieve success. CrossFit is great for cardio! Though many would think that cardio is great for getting in shape, it alone will not be enough. What you get from CrossFit training is more than just cardio, it will be a way to truly get your body in shape with great workout mechanics.